This morning, at the bus stop I heard two older women talking about how there’s nothing to eat on Passover. Yesterday, a friend muttered something my way about matzot and stomach pains. And over the last few days, I have come across dozens of posts about Passover-cleaning suffering. Dear friends, Passover is being stolen from us! 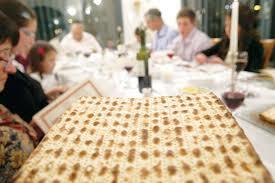 Passover is the most revolutionary holiday in human history: slaves dared to challenge the world’s greatest superpower and to attain their freedom through mindboggling miracles and through a historic show of heroism and national pride. Passover is a holiday of faith in human potential. Passover is about taking bruised and wounded slaves and whispering in their ears that they aren’t just numbers. They have dreams, feelings, and strengths. And most importantly- a destiny. A personal, God-given life purpose. On Passover, tell your children about previous generations and educate them to the true belief that they have the ability to follow in their courageous ancestors’ footsteps. Passover is the holiday of a nation’s great struggle, and of our readiness for the long haul, for a personal investigation (cleaning-out?) of our innermost depths. Passover is a holiday of simplicity: Flour+water+oven and knowing how to enjoy the simple, unsophisticated things in life. This year, let’s not miss the point of Pesach. Let’s not let supermarket-line kvetching steal it from us! Think about Passover. Live Passover. Love Passover. Every day until seder (8 days to go!) I will be posting a “Meaning-in-the-Cleaning Minute”: a minute-long video or short word of inspiration that made ME smile as I get ready this year for Pesach. Bs”d thank you.for posting this! I feel blessed to have been raised loving Pesach, and not hating it. Your childhood experiences are hard to redefine in the best of circumstances. Even more so in times of pressure. The joy and renewal in getting ready for Pesach, hard work included, were ingrained in my earliest memories, basics my mother passed on to us, just repeating what she saw growing up, and what I hope I passed on to my children. wow, may we merit to pass that on to our kids! !